So we keep an eye on them. The charts on GLD (the ETF that holds physical gold) have some ‘worry points’ in them. Not yet as much as during the Silver Bubble, but similar (if early). 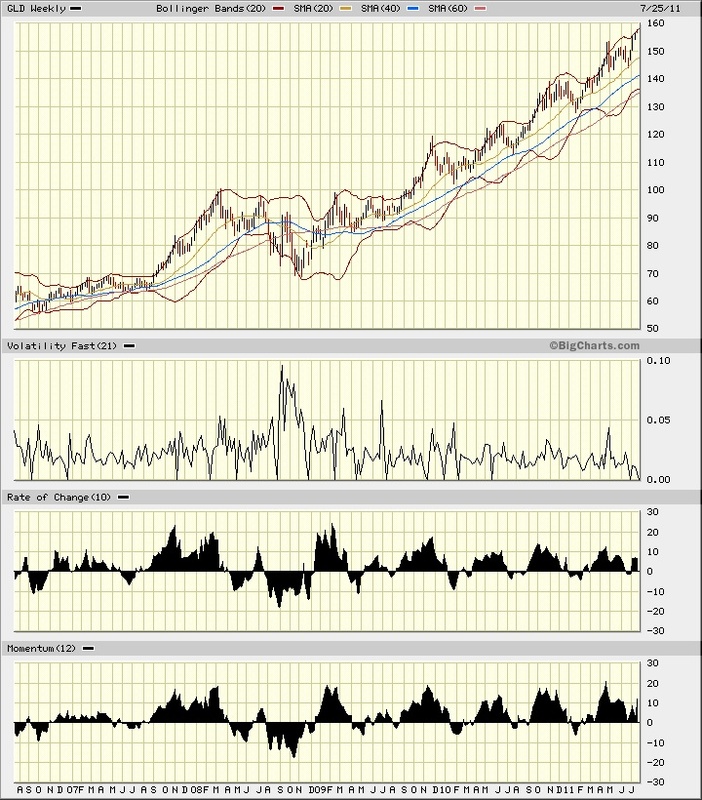 Most visible on the very long term charts ( a 4 or 5 year chart with weekly ‘tick marks’) there are some more subtile things on the one year daily tick chart. So what are they? The first thing to notice here is just the broad “disconnect” between GLD and the other metals. Even the XAU “gold and silver miners” index has “gone flat” the last 6 months or so. From about January of this year, there is just no ‘lift’ in the other tickers (other than the Silver Bubble we had in May – but even it has returned to conformance with it’s peers). Yes, each metal ‘inflects’ from rising to flat at a different time. Industrial metals, like copper – JJC, inflected earlier. It had a ‘correction’ in 2010 June / July then recovered a bit, but at less total gain / time, and has since gone flat too. (A similar curve is in PPLT the Platinum ETF, but it starts at zero at inception so all you get is the ‘wobble and flat’ parts on this graph). On the usual indicators, it’s pretty much “don’t worry, be happy”. The slowest is DMI. 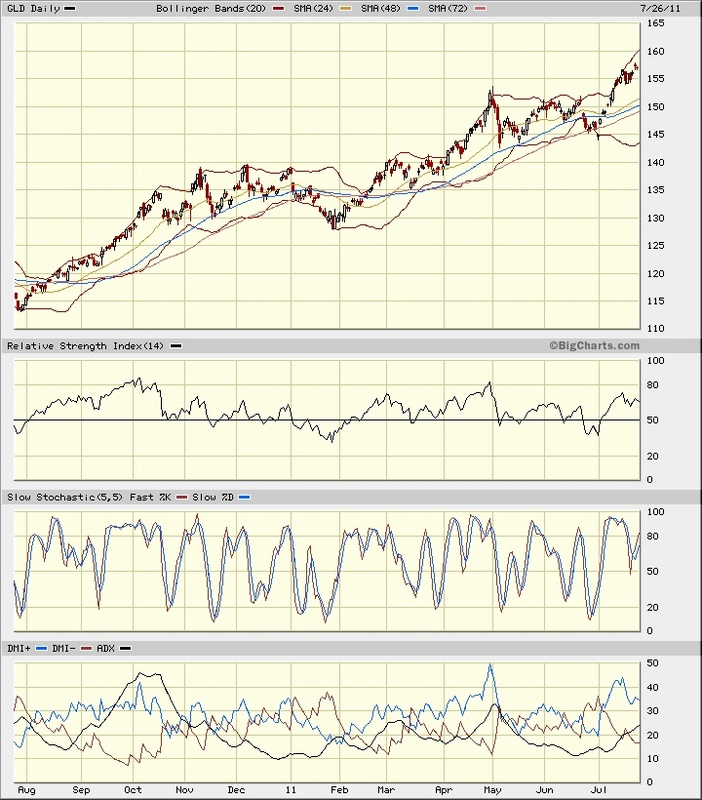 It is “blue on top” and with a steady sideways ADX and DMI+. Exactly what you see in a long running Rocket Ride ticker. DMI- is not inflected up and is just cruising on the bottom… But DMI is slow, especially on weekly tick mark charts, and when gold crashes, it crashes fast and hard. Are there other charts with other information? Do they soothe the worries or amplify them? In this chart, we have a couple of things going on. The prices we’ve already seen (though on this year longer chart they are more ‘compressed’ per tick mark so look different). On ROC and MO, sometimes one speaks more clearly than the other. They are a bit quirky and so I often don’t talk about them. In this case, you can see that each run up ends with an inflection of the ‘black mountains’ on ROC and MO. Each “buy the dips” is at a bottom excursion below the line. (During the longer down trend in 2009 you get the reverse ‘look’ with ‘sell the peak’ on the brief crossovers to the topside). What caught my eye here is a subtile thing. For ROC, the size of the ‘black mountains’ is shrinking over time. For both ROC and MO, the recent ‘rise’ is a very modest black spot so far. (IFF this run picks up steam, they could become larger mountains, but right now it looks like ‘weakened momentum and rate of change’). This is a bit more problematic as there are several markets where gold is traded. Folks might just be swapping from GLD to Futures or IAU or… But usually that kind of change takes months or years to impact and even more often, folks just keep trading the ‘leader’. At the bottom, Williams %R is modestly ambiguous. There is a small ‘skinnier’ above the 50 line in the recent runs, but the present run is not yet done, so gives no confirmation. Below the line is getting skinnier too, though. 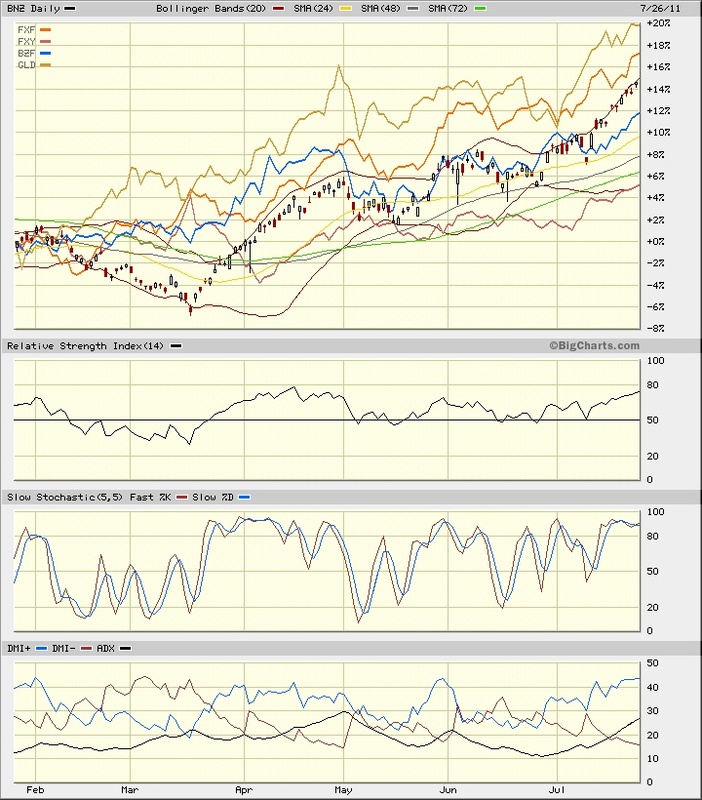 Slow Stochastic is ‘above 80’ so the next move ought to be to the downside – but who knows how far. Perhaps just another ‘dip’ to buy. I’m not yet willing to ‘call the ball’ on a Gold Bubble. It is toppy though. I’d not put any new money in, at this point, and I’d be scaling out of positions ( in fact, I’ve lightened my holdings of GLD, SLV, and some other metals; though I still hold some). I’m looking elsewhere for a ‘safe store of value’. Bubbly markets in commodities are NOT safe… That was one of the problems with the Gold Standard – the underlaying commodity is prone to large fast supply / demand swings and price excursions. Here we can again see the ‘squished’ price bars the last couple of days (though at this scale gold trades in small discontinuous bars a lot as the ‘price fix’ is in London, so you don’t get the benefit of seeing the broad price bars of a continuous market on days like that end June / start July bottom tick (that in a smooth market would be a broad bar at a bottom… instead it is an isolated ‘tick’ away from other prices. A “gap down”.) As Gold is very ‘gappy’ at this price scale, it’s easier to see the effect on the 4 or 5 year weekly tick mark charts). 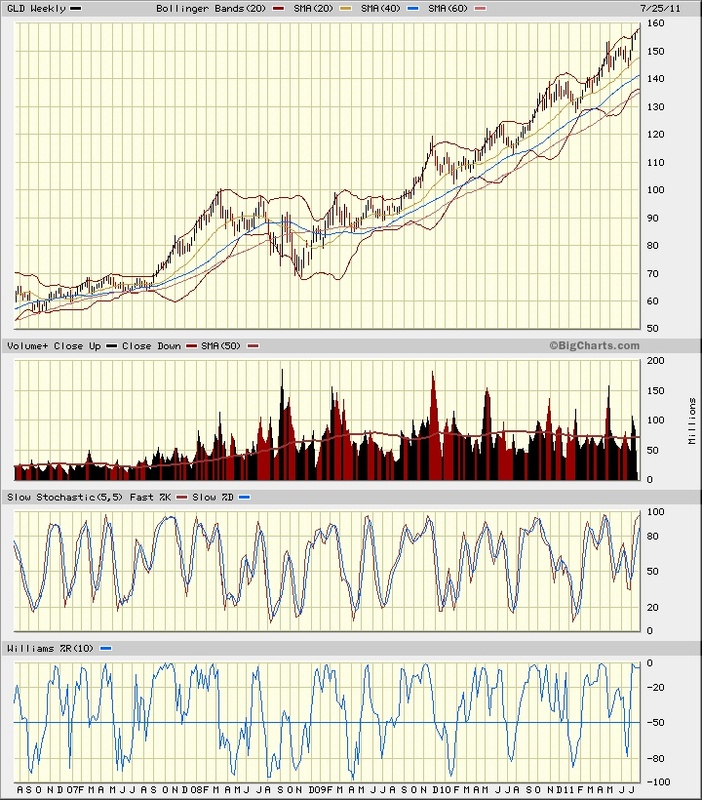 We also see RSI at ‘near 80’ in this last run up, but lower than the prior run up where it touched 80. There is still time for spike up in this run to make RSI ‘tick higher’, so it’s an ‘early call’; but at present it looks like were getting ready for ‘steps down’ in RSI and a topping call. So, all in all, I’m seeing now as time to “sell the news” (From “Buy the rumor, sell the news”) as we’re getting news of Congress playing footsie on a debt deal. Then, after that ‘news’, I’ll be doing a ‘reassess’ after the “deal” as to “top?” vs. “Buy the dip?”. This is a chart of the Kiwi Dollar from New Zealand vs the GLD gold, BZF the Brazilian Real, FXY Yen along with FXF Swiss Frank. (All ETFs you can buy as ‘stock tickers’, btw). Since Luis has leapt to the wrong conclusion from the above currency chart, I’m adding one here that is longer term (so shows the context vs the $US dollar better). 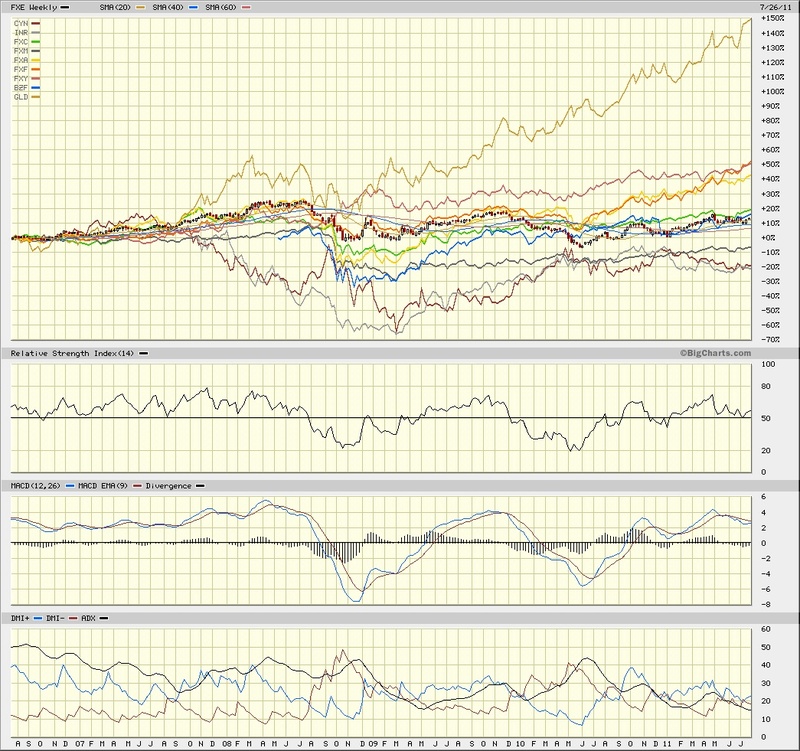 This is a 5 year chart of the Euro vs GLD and a basket of other currencies, all measured in $US Dollars. If it was a ‘dollar dropping’ story, they all ought to be moving more or less in sync (with minor variations based on each country balance of trade / payments and inflation rate). 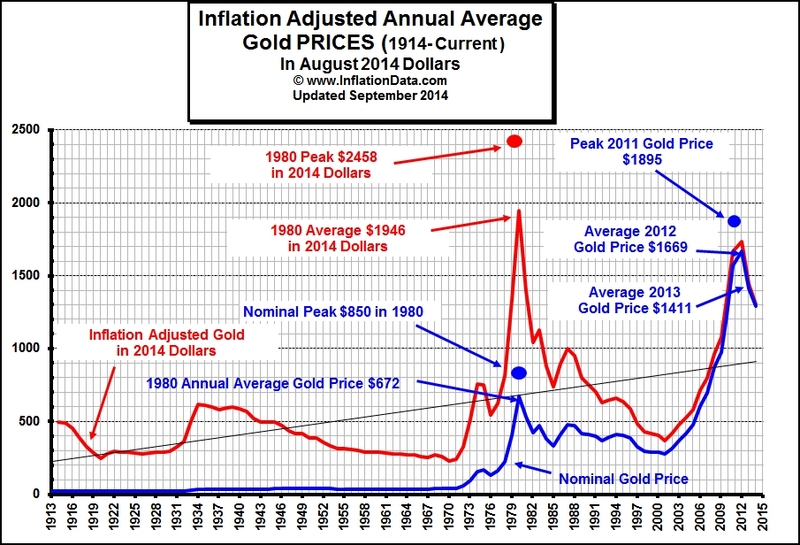 On Bloomberg they ran a chart of “Inflation Adjusted Gold” and found the price is about what it was at the top of the last bubble peak. A web search turned up these two charts from a bit earlier, so you need to ‘mentally fill in’ the price to date of just over $1600 / ounce. Again you get to mentally color in the price up to $1620 or so. Same story. And that is why I find things a bit ‘worrying’ right now. 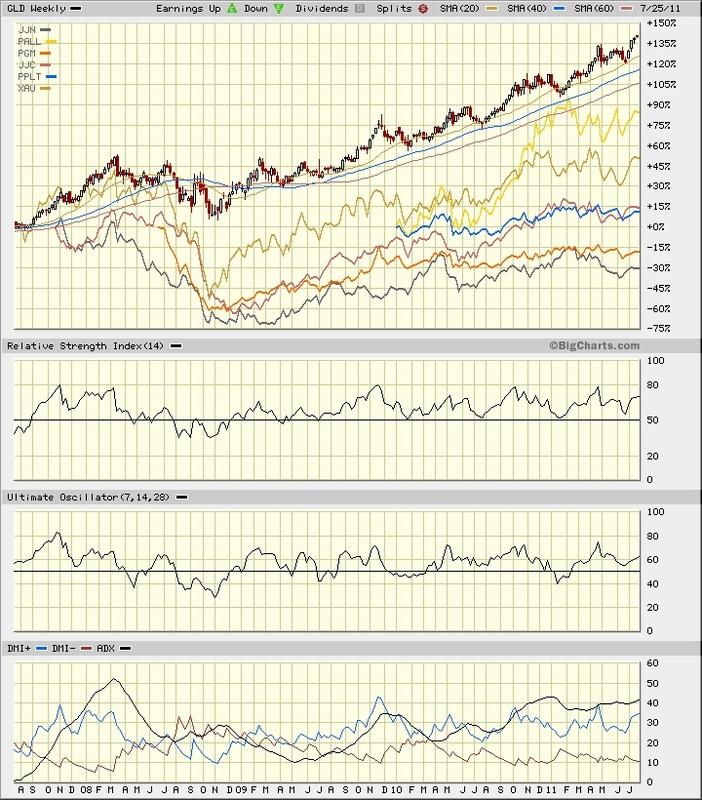 This entry was posted in Economics - Trading - and Money and tagged GLD, gold, trading. Bookmark the permalink. Fundamentals point to lots of uncertainty over the next week or more. Greece is already done, for a while. All have issues that won’t be resolved by political fiddles. So my view is the fundamentals still look good for lots of uncertainty, which is good for gold. As long as Obama is in office, Turbo Tax Timmy has access to the printing presses and the Bernak is considering another QE round (stealth or not) do not expect a drop in gold. I would sooner put my money in the Swiss Franc than gold. There is an ETF for that and the dollar has reached an all-time low against the Swiss Franc so it is likely going to be too late now, probably should have moved the money into that a year or two ago. Problem with gold is that the price isn’t a pure play on the USD while the Swiss Franc pretty much is a relative strength play. on the economy in general, I’m asking if we have got to the point where everybody is negative? What is the sentiment out there? A friend of mine runs an umbrella import company who is selling about 10 times his normal volume thanks to continuing rainy weather conditions. People hate him for his success. I’ve added that 6 month currency chart as a static chart to the posting. The link in the prior comment will get a ‘live version’ that changes over time. The point behind sentiment indicators (and ‘momentum’ indicators of various sorts) is to detect just such ‘everyone knows it’ over done sentiment… and early indication of ‘time to leave’ as ‘everyone knows Bernanke will bugger the currency’ so all the selling is done…). Oddly, the hardest thing to do is to convince someone that what “everyone knows” means it is “exactly wrong” to bet that way… Especially so when ‘late stage’ and topping, but not yet in the sickening plunge state. Even during the plunge, folks will argue that it’s just a ‘correction’ and be buying with both hands trying to catch the falling knife. E.M. Your final update is I suspect closest to the truth – gold is not rising, the dollar is dropping. The gold play post lead me to think of the recession in general. From there I wondered how sentiment on the recession was holding. The administration my be holding the inner-tube underwater very adroitly , but sooner or later that tube will slither away from their grasp and it will “fall up” like a bubble in beer. So I have two opposing ideas to fumble, or juggle. 1, The “This time is different” rule, and 2, They really are adapt at fouling up the business climate. Thinking the better part of a recession is made up of sentiment, if sentiment is at its worst, that is when the bubble falls up. And we come out of the recession like we usually do. At the same time thinking, this time is different, because it really is more than a snafu. are you seeing a dog chase his tail? sorry I’ll go away now. Yes, I’ve been topping up my gold & silver in comfort, using NZ dollars. No price increase. Feel sorry for all you poor benighted Obama-dollar users. Hi Michael. Once again you try to understand gold by looking at GLD, luckily this time you were able to reach some practical conclusion right at the end. There are other data out there on sales and stocks that show something entirely different from your bubble thesis. [ And once again, Luis, you try to attribute to me what I do not say. I’ve not said “It is a bubble about to burst”, but rather “The charts look like they may start to indicate “bubbly top soon”. Further, you seem to just LOVE buying into ‘stories’. The whole point of charts is to divorce yourself from ‘stories’, to see into the collective consciousness of what participants have already done. So, for example, if the Gold story were “dollar to be worthless, gold only real value”, that’s a great story right up until everyone has already bought gold; at which time the “story” persists, but there are no buyers left… Inevitably there is a “bubble and drop” at that moment no matter what the story is. Now, per your pointer to ebay sales: Slightly less than useless. Most of the drivers of gold prices are major buyers and sellers. Central Banks of countries, for example. They can trade more in one trade than all of Ebay in a month, if they so desired. All it really says is what the charts already showed: There are a lot of ordinary folks buying “the story”… So, visit London, ask the metals exchange if Ebay makes a bid during the daily price fix… and how much it matters when The IMF decides to sell $20 Billion in a day. My “story”, were I to endorse one, would be that most likely China is dumping it’s $Trillions of BOTH Euro and $US and moving that into “stores of value” such as gold and land in places like Brazil and New Zealand so that they can get food from those lands. (Africa, too, but their currencies don’t have ETFs to graph). WHEN they run those currency stocks down, the things they are buying will have a dramatic price sag (as has happened in every other commodity where they have had cyclical planned buying of stocks). That would explain the BZF / EWZ disconnect too. Which “story” is better? No way to know… without a heck of a lot of digging into data that are hard to find or not even available. And THAT is why the charts are useful. Because belief in the “story”, no matter which one it is, is just that. A “belief”. And about as useful as a belief that God will save you. So the “story” of “it’s the $US dollar dropping” fails a sanity test against other stores of value and other currencies. That makes it a fear trade story stock in a bubblicious run. Not “topping” yet, but getting there. When will the end come? Don’t know. It will most likely be a news driven event that stops the rise. Perhaps a budget deal. Perhaps Greece being kicked out of the Euro Zone and the PIIG rump getting religion. But when it happens, there will be a ‘failure to advance’ in the gold price, and a drop in volume of buying. Then a sickening plunge as all those folks who bought gold start trying to sell with no new buyers. But enjoy your bedtime “story”, and feel free to ignore my Grimm’s … and the moral in each of my ‘fairy tails’… -E.M.Smith ]. I have bought gold not to make money but to have money. Banknotes will not do as well in ten years time. Although I got my formal education in Economics, I am a Network Engineer, and do not play the market (I let my advisor do that). So I usually skip your mark posts as I am not really interested. But this one got my interest up. 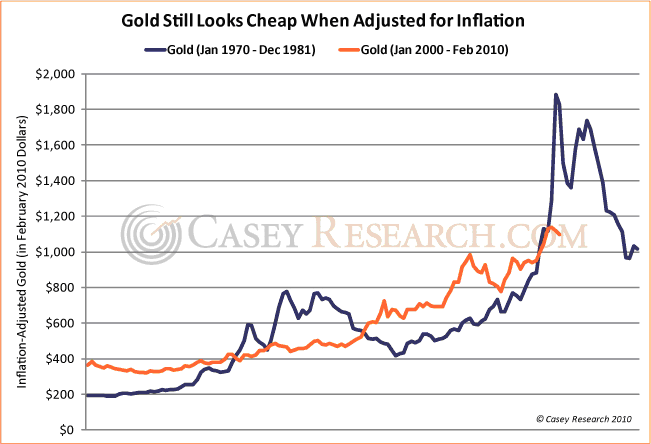 I have been watching gold – more as a reverse economic indicator than an investment decision. So I was intrigued by your prediction. I like the logical sense of it, and yes, it is a “story” issue now. Everyone is being told to jump into gold for safety. When that happens, I make sure I do not follow the herd. Some are going to get rich, but not everyone. I’ve added a 5 year currency chart so folks can see the divergence between Gold and a basket of non-US currencies over the longer time period. The 6 month chart is useful for “who is buying something somewhere now” and argues for folks buying “stuff” from New Zealand and Brazil (likely not their stock markets as EWZ is flat to dropping) but their land and agricultural products. 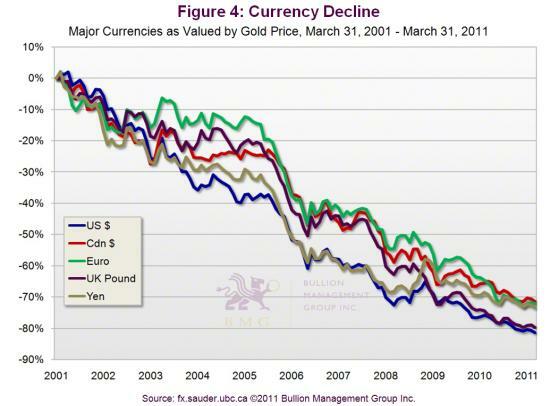 The 5 year chart gives perspective on Gold vs (everything else) and shows how gold is rising out of all proportion to inflation of currencies (unless, of course, one wishes to tell the Swiss that their Franc has dropped to 1/3 the value of 5 years ago… clearly not the case. So it is gold rising, not currencies dropping, for the bulk of the move. I’d give it about 20% via currencies by a visual average of the right hand intercept. Hopefully this will help folks get a balance between how “stories” make them think vs how “compare and contrast with other stores of value” reports the relative movements. Yeah, a lot of us Economists learned the law of supply and demand; and that there was a large supply of Economists and almost no demand… but saw a large demand for Tech Guys… Me too… So my ‘day job’ is in computer stuff. Go ahead, just rub it in… Would you like some salt too? It isn’t “different this time”, but you have to pick the correct reference point. FDR was he original model ( though Nixon was called ‘the last Progressive President in his wiki page … and we all know how happy we were with him…) so just look to FDR as your model / guide. The Progressives like to think he fixed the economy and saved the world, so want to do more of ‘his stuff’. Yet his Progressive Agenda was WHY the business recession turned into The Great Depression. (Well, his and Wilson’s “great works”…). Repeat for: Chemicals, rubber, tires, finished goods, furniture, clothing, computers, semiconductors, metals refining, metals manufacturing, painting anything, shoes and leather goods, car parts, cars, appliances, …. I suspect $3000 / oz is a bit ‘generous’. Personally, I’d “guess” more like $2000. Traders like to run at round numbers, so at $1600 and rising, we’re likely to ‘take a run’ at $1800, and if THAT happens, it’s pretty much a ‘done deal’ for a $2000 run. It’s at that point that the traders would start to cash in and selling pressure would likely develop. The charts say there is a ‘pause / worry’. But that could be quite adequately explained by the “story” of a debt deal due in a week… So we’re at a “news flow” inflection point. Often you get a pause then. WHEN the news hits (whatever it is), we’ll have the “battle of the stories” and we’ll need to see which one captures the imagination. “Tea Party Brings Discipline” (with carping of “end is near due to default”) vs “Nation Saved By Debt Bubble Growth” (with carping of “end is near due to inflation”). Four possible stories, and the winner determine the mass mindset that will drive the prices… 50 / 50 odds of more gold Rocket Ride vs Bubble Bust. Even a common-good-socialist kinda colleague here in hypertaxed Germany today told me he considers buying Gold – the kind of colleague who’d never buy a stock, as companies are evil exploiters of the working man. The last time that happened to me was when during the last big oil bubble a colleague in a cafeteria told me that oil would only go up from there. Of course, that was exactly at the peak of the bubble. But I would change it a bit and buy land rather than houses. Find a nice piece of ground with some water in Southern Utah or Southwestern Colorado. I saw that article too and I think you are probably seeing the same thing in that chart that I do: The Housing market is almost back at where it belongs and the Boom and Busts seem to be on a regular cycle. If you look at that chart you will notice that housing was slowly rising until the 1920’s when you had a mini bubble which the Great Depression wiped out. Then you had the post war economic boom which led to another bubble that crashed in the 70’s back to around 100K. Then right after that we started the Boom that went bust in 2007/8. Basically it looks like a roughly 30 year cycle (1900-1929, approx 1940 – approx 1970 and 1981 – 2007/8). All told, swapping gold bars for bricks, whether as investment or a place to live, hasn’t looked this attractive since the inflationary depression of 1981. US housing’s previous low came during the deflation of the Great Depression. Never mind that the average US home doubled in size inbetween, or swelled another 40% since. Because whichever flavor of depression we’ve got today, the immutable object of unchanging, unencumbered gold has once more whipped back to its pre-20th century value against the ever-changing, credit-reliant market of residential housing. It’s almost as if the “long boom” of easy credit never happened. At bottom, the average US home cost the equivalent of some 71.5 ounces of gold in 1934. Forty-six years later, it fell below 77 ounces of gold. Today’s 103-ounce price tag isn’t rock-bottom yet. But compared to the top of a decade ago, it’s getting there. So the “story” of “it’s the $US dollar dropping” fails a sanity test against other stores of value and other currencies. The sanity test would be to compare the supply of gold against currencies such as the euro or the dollar during the last decade or so. You could also check the figures for physical deliveries at the COMEX, LBMA and the asian exchanges during the same period. It is interesting to note that you treat silver as dead and buried, while it’s price is presently above 40 $/oz. I believe you are looking at things from a very short term perspective. [ -E.M.Smith:And I believe you don’t read very well. So what? “Belief” is relatively useless. As I pointed out, per silver, it would drop, have a Dead Cat Bounce, then a ‘ring down’ and then most likely start to rise again on a return to long term trend. That is exactly what it did. Also I had said ~”you can buy it cheaper after the drop”, which was exactly right (and I did, and then sold again on the next short term top). So no, Luis, I do not treat it as “dead and buried”, I treat it as a volatile commodity prone to “bubble and drop” with the typical patterns all such have. (Parabolic rise, plunge, Dead Cat Bounce, decaying oscillation aka “ring down”, resume trend; eventual repeat). Commodities are VERY useful for trading, pretty dicy as an ‘investment’… That I do not subscribe to your emotion driven faith in it as Gods Gift Of Stability and Growth is “not my problem”… It is just a commodity, like all other commodities, and with the same “issues” as an investment vehicle. Do I use a short term perspective? Well, “yes and no”. IFF you would bother to actually read what I write, you would see that I have a “variable time scale”. I look at a 5 to 10 year (weekly tick mark interval) chart to set “context”; then “slide in” to the time scale that is most useful for any given set of trades. Typically a 1 year or 6 month (daily tick mark interval) chart. Sometimes (when markets have gone very flat) a 10 day (hourly or 15 minute tick mark chart) if that is the only place with price trends to trade. I’ve regularly admonished folks that they need to “pick THEIR time scale of interest” and frequently point out that the reason one Talking Head will say FOO is going up while another will say “going down” is precisely because they are working different time scales. BOTH can be right, but using a different time scope. As a consequence, I slide between 2 to 3 scales to assure I’ve got my context right AS I make shorter term trades inside that context. Why do that? Well, as you saw (IFF you bothered to look) it saved me from buying silver at near $50 / oz and then let me buy it at about $35, and then sell it higher (for the portion I sold). So instead of being DOWN $10 / ounce, I’ve got profit in the kitty AND holdings at about a $35 basis. That’s why. No, I don’t have “day trader postings” on those trades. It happens too fast for posting and I think most folks would not be interested. Yes, I did specifically say “You can likely buy silver now” just a bit after the DCB was done and during the ‘ring down’ phase. Hardly “dead and buried”. But you prefer to assert what I have not said, and act from your preconceptions, not from what I’ve written. You also prefer not to look at the history of accurate “calls” and like to ignore the dollars gained by them. Fine with me. Just don’t say I did something that I did not do. It gets old fast. Per your desire to redefine what the “sanity test” ought to be: Um, supply is only 1/2 an answer (and not a very useful 1/2). I’ve posted the comparative prices of other ‘stores of value’ and currencies. Clearly gold is the one that is ‘out of whack’. The “why” is pretty simple. Demand. Not supply. (The miners are fairly stable). Demand is a function of emotional excess (as you so admirably demonstrate with great reliability) and “belief”. Unfortunately, they can be very fast to change and fickle in action. (That, BTW, is why gold and sliver are prone to “bubble and bust”… Relatively fixed supply, highly variable demand due to emotional swings.) So you have bought into a “story” that you are in love with. You will defend your love against all comers. Fine. Just don’t expect others to ratify your fixation. COMEX, et.al. and especially Asian deliveries are just a measure of that emotional excess. Validated for ‘a while’, then violent in the rebuke. Look at the Bloomberg chart above of the ’70s round of this same process. Look at the DOWNSIDE of that “spike and plunge”. Then ponder the risk of buying gold now. Yes, it has some upside yet to go, but ever more downside below you. “Managed the RISK and the reward will take care of itself. -E.M.Smith” You, Luis, are fixated on, and making decisions from, fear and greed. Fear of currencies and greed for gold. Neither fear nor greed is a good tool for decisions. You then want to complain that I’m not embracing the stories of fear of currencies and greed for gold; as though that were, somehow, ‘a bad thing’. Yes, I’m not embracing those stories. And that is EXACTLY the whole point. And it’s a very good thing. “In late, early out. -E.M.Smith”. That’s a basic trade rule of mine. It prevents trying to ‘catch a falling knife’ buying too early AND it prevent overstaying a trade (or a “story”…) and selling too late. It lets you catch the “sweet spot” in the middle of the run and avoid the two risky ends. So now, IMHO, is the time to be edging toward the exit door in gold. Moving into something else that has a lot more upside and a lot less downside risk. Yes, I still hold some gold (not a lot. Maybe $5000 – $8000. I’ve not totaled it up lately) but not the $30,000 I held a week or two ago. Probably sell down to about $2000 when the news of the “budget deal” hits. (“Buy the rumor, sell the news”). Basically, a “buy at $1600 with a $2000 peak likely ‘soon’ and a $800 plunge in days after it risk” is just a lousy trade risk / reward ratio. George & Boballab – Housing is, by trends and history – a good buy. But the problem with housing right now is not where it “should be”, as that would be a definite buy. There is still a massive amount of foreclosures that have to work their way through the system, and until that finishes (with luck, in about 6 months to a year), housing will begin its recovery. The issue with foreclosures is they are basically being unloaded at firesale prices, and that depresses the market for all houses. Banks have an asset they do not want (the house), so unload quickly. It costs them money to maintain the asset, so the longer they hold it, the less they realize from the sale (normal people can and do hold them for a long time because they are working the asset – i.e. living in them). For an indication on when to start buying houses, watch the backlog of foreclosures. Once it gets down to historic levels, that would be the time to start buying. Kind of wonky, but I have come to respect my Uncle in this (now retired, but made his fortune in real estate). Also keep in mind those people that had their homes foreclosed on, they too thought housing was a “good” buy in bubble and it would just keep increasing in value. Alas like every other bubble it pops and the value goes back to were it belongs and for housing that is historically 100K of gold. You see that “good investment” only works for three types of people: The one that buys and sells property to make money, the people that buy a house to live in with cash and have no mortgage and people that buy the house with a 30 year mortgage early enough in the bubble. Everyone else gets screwed. If this cycle is like the last one I lived through, the next step is a bubble in “collectables” and land. (And, as you noted, ‘houses not so much’, though they do ‘recover’ in nominal terms). Yes, there is a ‘generational’ cycle to housing boom / bust. Fairly regular right now at the 30 year generational time. May dampen out now that the “boomers” are aging and the ‘eco-boom’ is smearing out. After that not much more needs to be said. The number of flat out lies from the Democrats is astounding. Getting a larger credit card is defined as ‘paying your bills’. NOT putting more things on credit is called ‘a grave risk’. Passing two bills out of the house and nothing out of the senate is called “obstruction” by the house. Just bunk and bull. The simple fact is that there are not enough resources to cover the promises. Something has to break. Democrats are trying to use that for political advantage (“Never let a disaster go to waste”). They have no interest in ‘fixing it’, only in ‘best advantage from it’. IF they “win”, the country is headed for a Greece like collapse in under a decade, perhaps as soon as 5 years. (That’s a simple financial consequence of the spending rate, NOT a political statement.) IF congress “fixes things”, there will be a near revolt from all the folks who find out that they don’t get goodies after all. I’m not sure the government can survive THAT either. There is a point in a failure mode where you can choose the nature of the failure, but not have a ‘non-failure’ outcome. IMHO, that’s where we are. But it’s a process that takes a generation to happen… so folks think it isn’t happening… even though we are now in the last few years of that generational process. So while I find it an interesting drama to watch (sort of… knowing it ends badly is kind of a bit of a spoiler…) as the congress critters posture and preen; I find it terribly off-putting that they don’t seem to understand that they are strung out and need to pull the needle out of their arm. They think One More Fix, JUST ONE MORE… and everything will be FINE again!!!! They are so used to lying they don’t even hear the lies anymore. As Rubio is not running for president in 2012, he really needs to be Senate Majority leader if the Republicans taken control in 2012. YUP! Gold is way over priced. 3 times more then cost at least. If you must, own Platinum or better yet good farm land. The IMF should be dumping some gold here soon for more European bailouts.